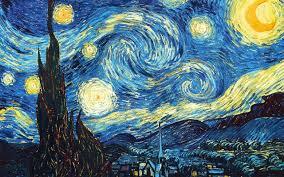 Starry Night by Vincent van Gogh is a depiction of a village in a whistling night. The swirls are designed to ensure the viewers eyes move around the picture and create a point-to-point effect. It was a surreal painting designed to enhance the overall senses drawn from the picture. He purposely used things like lines where shadows would have been more correct and bright yellow stars where only small figure was needed. Some have argued that the peaceful village and stormy night are dichotomies. One offers safety and protection with inviting lights in the window. The night is uninviting, interesting, but wholly a wild place. As with all art, there are psychological interpretations that include his feelings and inner conflicts are expressed onto the painting. A few have argued he suffered from lead poisoning changing his perception. The Cyprus brush is right in front of the viewer and sort of distorts the view. Analysts believe that the author is expressing his emotions and fears into the painting. He creates his own reality and gives the components within the painting a bigger than life expression indicating the vividness of his memory. The brush appears to be knotty and creates disequilibrium within the painting that leaves viewers perplexed. Van Gough was a post impressionist who attempted to free the art from the forms of the world to create feelings and moods within the viewers. An impressionist would try and paint reality exactly as they saw through their emotions with heightened sensory colors. A post impressionist attempts to distort the lines and use unnatural colors to create feelings. The paintings are not supposed to be exact reality but full of life beyond reality. The interpretation I prefer is the people sleeping in the quiet night village are wholly unaware of the life of nature outside. As humans we are focused on our routines and patterns that center around our immediate needs. Despite our narrow focus the world and its nature continues to move with more life than most of us understand. No one knows the true meaning of the painting thereby leaving the distinct possibility that Vincent van Gough was a night owl who simply enjoyed the life of the evening air. You have to decide for yourself.